Playful mismatched studs hold an understated yet powerful message. The key to finding peace and love is all in the wrist. Or for Christine Schmidt: The fingers. 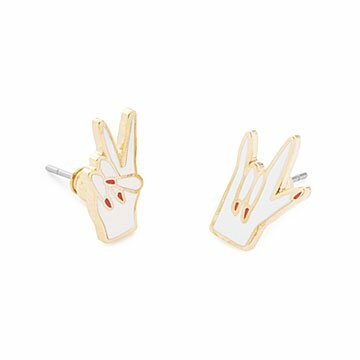 Her playful mismatched studs are crafted to look like tiny illustrated hands holding the signs for "peace" and "love." An understated, elegant detail with a powerful message, they make an excellent gift for cheerful friends and loved ones who always find the bright side. Handmade from 22k gold in California. I was so stoked to see these arrive - they are even nicer in person! Great dainty size that looks put together instead of gaudy. Very well made and sturdy, these have gotten me many compliments from just one wear. Highly recommended and I'll be back for more styles soon! I would totally buy these again! I bought these as a birthday gift for my 14 year-old niece, who likes different things, is laid-back and is not flashy. They are high quality & a reasonable price. Her older sister loved them too (I caught her wearing them)! Given for 17 year old birthday. She loves them wears them almost every day. My ears are spreading some peace & love! This made a wonderful gift for my daughter, who is studying communication science and disorders. Learning to Sign is a part of her studies. She was so happy to receive these earrings. This product will be loved and be used for everyday attire.